This webpage has been designed to provide readers a concise overview of some of the key characteristics associated with pathogens specifically known to cause human infections and illnesses. Generally, the word 'pathogen' originates from the Greek word pathos meaning suffering, and gen meaning to give birth to. Thus, a pathogen is a generic term that describes any organism capable of producing a disease, such as a virus, bacterium, or other microorganisms. Throughout history, and even today, pathogens have been responsible for massive numbers of causalities and have numerous effects on afflicted groups (Figure 1). Of particular note in modern times is hepatitis B virus, which is known to have infected several million humans globally and continues to threaten the lives of people, along with HIV and the notorious influenza virus. While they are relatively small in size, many pathogens have the potential to replicate to high concentrations and eventually cause death to the invaded host within a few days if not treated appropriately. This is why it is particularly important to acknowledge the dangers these microorganisms pose on human health and life, and the pathways that constitute a particular biological process associated with their mode of infection. Figure 1. The Triumph of Death by Pieter Breughel, the Elder. 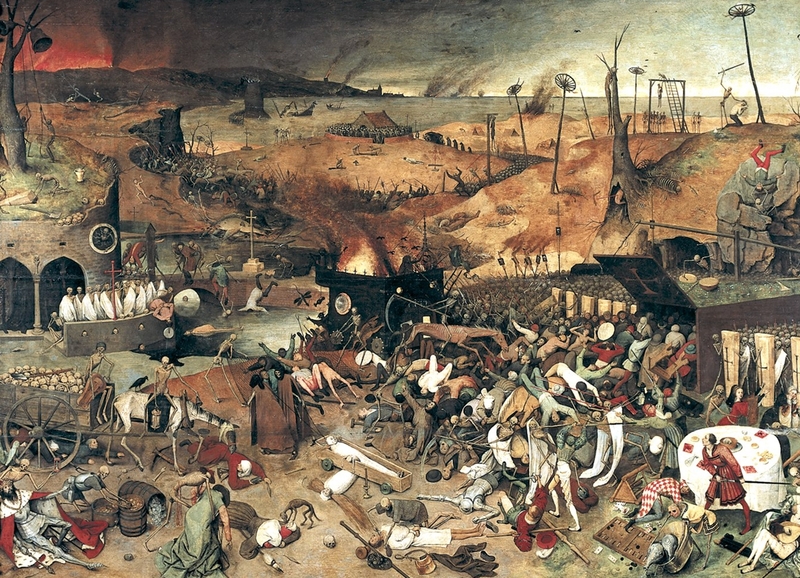 This painting reflects the social upheaval and terror that followed the bubonic plague, caused by the bacterium Yersinia pestis, which devastated medieval Europe. Click to enlarge. While social advances such as food safety, hygiene, and water treatment have reduced the threat from some pathogens, and other medical advances have safeguarded against infection through the use of vaccination, antibiotics, and fungicide, pathogens continue to threaten human life. In addition, although the body contains many natural orders of defense against pathogens, some possess specific strategies to exploit weak points in the body. For instance, bacteria such as the Gram-negative Pseudomonas aeruginosa are able to resist destruction by secreting enzymes known as elastases that inhibit host-cell proteins from invoking an immune response against the bacteria. Similarly, other pathogens are capable of altering their physical structure or rapidly change their surface antigens so that immune responses generated in the past are no longer protective against reinfection. Other pathogens are able to hide within host cells or even mimic host cell surface structures to escape a particular host response. All these mechanisms and more have been described in detail and will make more sense as you read on, with diagrams created to aid you through the intricate processes. Furthermore, each profile aims to provide detailed information on the pathogen's physical structure, morphology, features used for diagnosis, the types of infections or diseases it causes, pathogenicity, virulence factors, health risks, and information related to how the pathogen can be controlled. How the body copes with these infections and how pathogens exploit the defense systems of the human host will also be a reoccurring theme in each profile. To your right is a list of different types of notable pathogens as categorized by their structural characteristics.